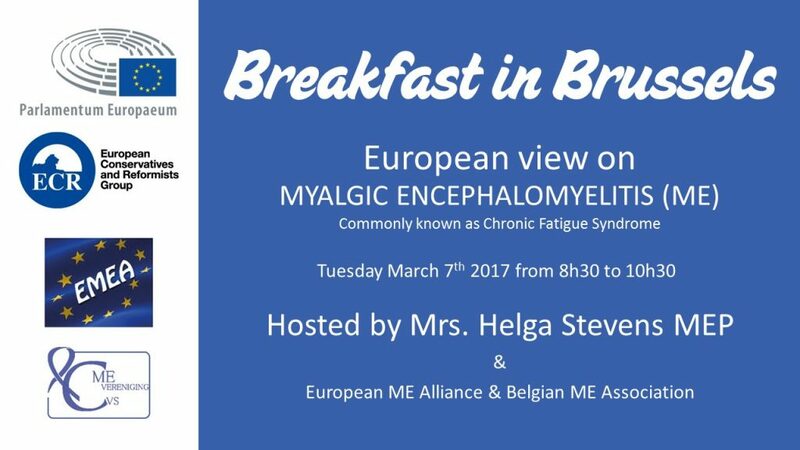 On 7th March, EBC attended the Breakfast Colloquium on Myalgic Encephalomyelitis in the members restaurant of the European Parliament hosted by MEP Helga Stevens, organised by EMEA and the Belgian ME Association. Formed in 2008, The European ME Alliance is a grouping of European organisations who are involved in supporting patients suffering from myalgic encephalomyelitis (ME or ME/CFS) and are campaigning for funding for biomedical research to provide treatments and cures for ME. The meeting covered different topics that Members of the European Parliament ought to be aware of – including creating awareness on the quality of life and disability regarding people with ME. The goal of the meeting was that EMEA could begin the process of adjusting the perception, treatment and funding of research for myalgic encephalomyelitis within the political environment in the EU. The line-up of speakers included Dr Ian Gibson (UK), who gave an overview of ME & EU Issues, followed by Dr Olli Polo (Finland), and Dr Anne-Marie Uyttersprot (Belgium) who shared their insights on MD’s View of Issues. Nancy Van Hoylandt (EMEA Belgium) an ME patient shared her story and discussed issues relating to quality of life and her life as an ME patient, while Neurologist Dr Louise Brinth (Denmark) spoke about challenges & care for patients from the clinician’s point of view. MEP László Lovász (Hungary) spoke about the UN Convention on Rights of persons with Disabilities, and finally Dr Nigel Speight (UK), a Paediatrician spoke about children and ME. Other researchers from Europe were also present and contributed to the discussions. The meeting followed intensive work by EMEA members recently within Europe – having opened discussions with the WHO on ICD-11 and writing to the Danish Members of the Funktionelle Lidelser Working Group. Most importantly, this event was an opportunity to hear from patients struggling with a severely debilitating condition, and who are facing ongoing challenges with receiving treatment and accessing disability benefit.